Zomato’s making more money than before, but it’s also spending a lot more money to do so. Zomato has said that it earned revenues of $206 million (Rs. 1552 crore) for FY2019. Compared to its revenues of $68 million last year, this is a healthy threefold rise. 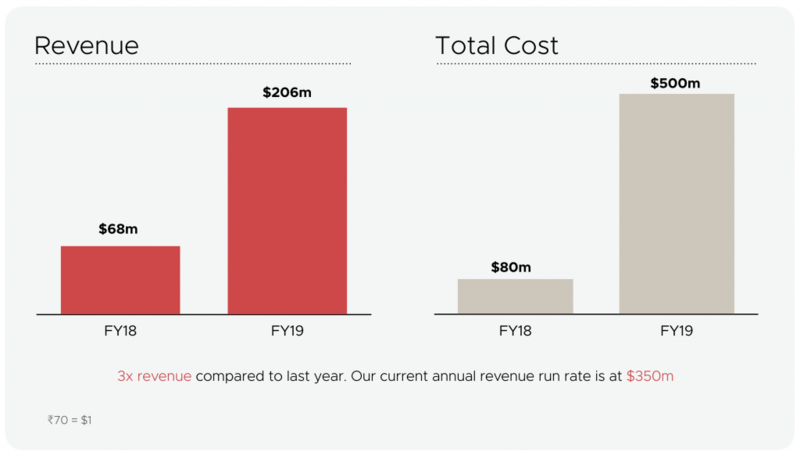 But the corresponding costs column wouldn’t bring as much cheer — in order to earn three times more revenues, Zomato’s costs rose sixfold, increasing from $80 million last year to $500 million this year. This means that Zomato has ended up with a $294 million (Rs. 2058 crore) of loss, compared to just $12 million (Rs. 84 crore) last year. A 24x rise in losses would alarm most companies, but Zomato’s put up a brave face to its results. The company has said that most of its losses were on account of its food delivery business, and its high costs were because it was entering new markets. “Food delivery in India is creating an entirely new market; 70% of our regular users in Kolhapur had never tried food delivery in their life (even over a phone call), and Zomato was the first food delivery experience of their lives,” the company said. “All the marketing investment we made in FY19 will bear fruit in FY20 and beyond — when we realise the LTV (Lifetime Value) of the users that we have acquired,” it added. Zomato appears to be betting on the loyalty of the customers it’s acquired, hoping that they’d stay on to be regulars. But that isn’t always true in India — Indian customers are among the most fickle anywhere in the world, and at times go to great lengths to find the best bargain. And India’s food delivery space is fairly cluttered — apart from Zomato, Swiggy, Foodpanda and UberEats are trying to woo customers, and there’s no telling that the customers that Zomato’s expensively cultivated will stay with the company. But for now, Zomato says it’s meeting its targets. “This year, we hit all of the goals we had set for ourselves out of the park,” it said. It would, though, do well to keep an eye on the bottom-line — rapid growth is fine, but as many food-tech companies discovered in the great foodtech crisis of 2016, extended losses can be sustained only for so long.